Let Professional Genealogists Help You! See Tab Free Research. At American Ancestors, it is our mission to connect generations. We believe that your family’s genealogy cannot be encapsulated in a simple subscription-based printout. Your family history is much more than that; it is the complex piecing together of facts and background information that becomes the story of where you and your family came from. We seek to see the humanity in each of our client projects. We approach each of our projects with humility and a constant commitment to reconnect our clients with their progenitors. Why Are You Searching for Your Ancestors? Native American DNA. Now What? Click here. Often times, people seek their ancestors because they want to know who they came from to determine who they are as the present day result of their predecessors. Studying your family’s ancestry can provide answers to questions such as why your family emigrated from one country to another, what your family’s original surname was before it was Americanized, and learning about medical conditions which may be passed on genetically. Other searchers have legal rights and privileges that can only be fully exercised or restored with proof of family history and blood lines. We’ve found that no matter the reason why a person or group may be seeking their ancestors, once the project is completed, many of our clients have a strengthened sense of self, support and peace in their lives. 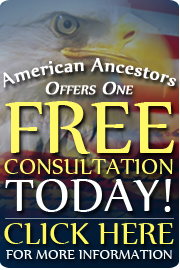 American Ancestors is here to provide the expert research services that only an expert can provide. At American Ancestors, we have assembled a team of dedicated, expert family history researchers and Master Genealogists for you, our client, in order to provide the highest quality of research and results.